It was touch and go Wednesday as we kept waiting for the weather to clear and get confirmation of our flight from New York to Rome. The flight was cleared for departure but unfortunately the bad weather followed us across the Atlantic. The awful storms that had been tearing across the country resulted in one of the most harrowing flights we've ever experienced. Finally Thursday's dawn broke along with the weather as we headed over the Mediterranean and the Italian coastline appeared in full sunshine. 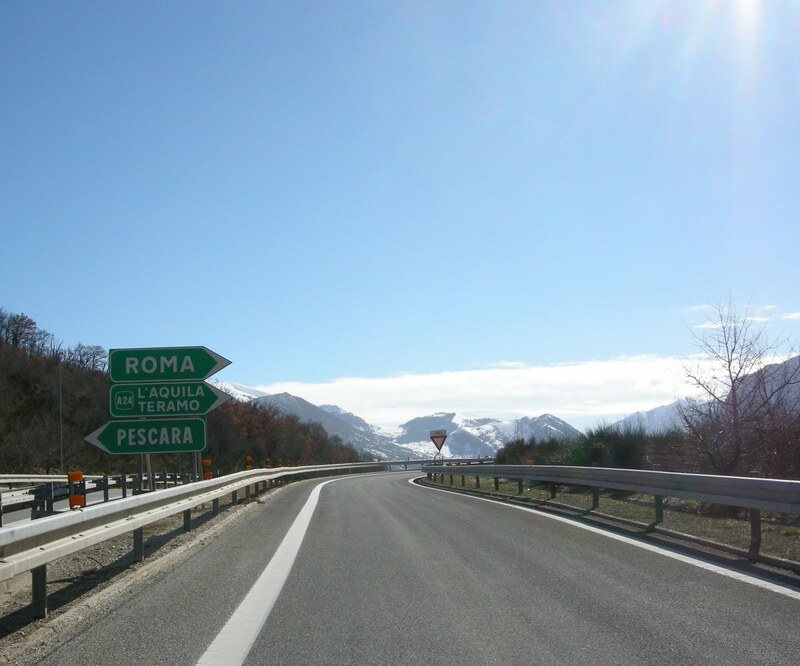 With little fuss we landed, retrieved our luggage, picked up our car and headed into the mountains of Abruzzo. This region has some of the most spectacular scenery we've ever seen. Huge craggy snow-capped mountains and medieval villages clinging to the sides of hills. Our destination was the beautiful town of Sulmona. If you've seen the George Clooney film, The American, much of it was shot here. (Unlike Hollywood, however, you won't find pictures of Mr. Clooney posing with every shopkeeper in the piazza). After driving in circles for a while we finally found and checked into the Hotel Rojan. 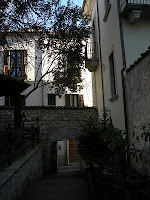 This is a charming spot on a quiet out-of-the-way street in the historic old part of the city. We were able to park the car and walk to everywhere. 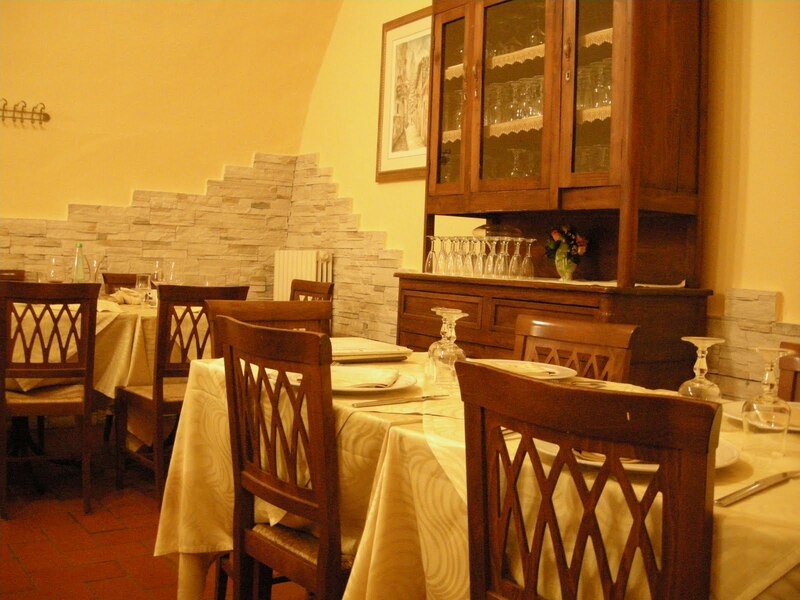 The lunch hour was long over but the hotel owner was able to get us a table at Il Vecchio Muro, a quaint (is there any other kind) ristorante not far from the hotel. We started with a shared appetizer Fantasia di Ricotta, an aged juniper smoked ricotta topped with an assortment of housemade condiments. We both followed this up with Chitarra alle Castagne, a hand made, hand cut pasta with guanciale and chestnuts. Yum! -- Chitarra is made by rolling out pasta in sheets and then placing them across the top of a board that has wires strong along it (like a guitar), then pressing into the wires which cuts the pasta. -- After coffee the owner offered us a local digestif, Amaro d'Abruzzo. How could we resist? The herb based after-dinner (lunch?) drink was the perfect cap to a great meal. A long stroll back to the hotel revealed many hidden gems in this lovely town. In our round and round of driving to find the hotel we missed most of the sights. Sulmona is a secluded and often overlooked small city. It's about the same size as Laguna Beach but instead of hills on one side and an ocean on the other, Sulmona is surrounded by imposing mountain ranges. Recuperate from lunch, have a light jet-lag easing nap and suddenly it's time for dinner! This time the hotel recommended Hostaria dell'Arco, an intimate rustic locale far off the tourist track. 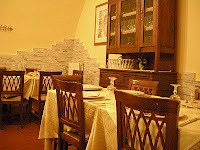 The owner explained about the antipasti, an enormous assortment of grilled & marinated vegetables and peppers, marinated porcini and spinach, fried balls of ricotta, and an amazing ricotta baked in a wood-fired oven. Next for primi there was another Chitarra, but this time with tomato and basil and a Raviolini all'abruzzese, large ravioli stuffed with porcini and cream topped with pomodoro and cheese. As if this wasn't enough we (well Stephen really) still had one serving of Agnello alla brace, lamb, rubbed with herbs, cooked in the wood fire. Simple, pure, delicious. Again, espresso and Amaro then a long walk home. Then a welcome sleep. We promise tomorrow we'll do more than just eat! Ciao.